Now that I’m deep into Laura Shapiro’s book, “Something from the Oven. Reinventing Dinner in 1950s America.” I realize it isn’t just me. Women in the 1950s felt the exact same way I do as marketers tried to sell their products by promising an easy way out of cooking. Woman felt like they should cook. That it was their duty, and a chore most women actually enjoyed. Cooking was a matter of pride, just as it is today. (Men often fit in this category too. Or I know my dad and brothers do anyway.) For example, no one felt they could brag about a cake made from mix back then, but one from scratch was worthy of showing off. Maybe most of us still feel this way 50 plus years later. I can’t be the only one right? Even though I made these cookies, and they are a variation on a mix, I still don’t feel I can take real credit for baking them. I have a funny little story about Laura Shapiro before I set you loose with this recipe. Although I’m certain she doesn’t remember me at all, I followed her around and talked to her for two days at a food photography conference last June. I just thought she was a neat person who had the same first name as I did. Little did I know she was the Laura Shapiro who wrote all of my favorite American women’s history and food books, plus lots of good articles! Until the day I was leaving that is, and I didn’t even find out from her. It all clicked when I found her Julia Child book for sale on the authors' table. I’m such a genius sometimes. Geesh! The good news is Laura is really sweet and great to talk to, even if I can’t tell her now that her books are wonderful. So if you find her, please let her know for me. This brilliant cookie take on a favorite coffee drink is by 2009 Betty Crocker Cookie Contest Winner Edwina Gadsby from Great Falls Missouri. They really are wonderful, so ignore any feelings of guilt and enjoy them. 1. Heat oven to 375°F. In large bowl, dissolve coffee powder in hot water. Stir in cookie mix, flour, butter, vanilla and egg until very soft dough forms. 2. Shape dough into 1 1/2-inch balls (I made 1-inch balls). On ungreased cookie sheets (use parchement paper here), place balls 2 inches apart. Using thumb or handle of wooden spoon (floured pastry tamper works best), make indentation in center of each cookie. 3. Bake 8 to 10 minutes or until edges are light golden brown. (Re-indent cookies right away) Cool 2 minutes; remove from cookie sheets to cooling racks. 4. In small microwavable bowl, microwave caramels and milk uncovered on High 1 minute to 1 minute 30 seconds, stirring once, until caramels are melted. Spoon (about) 1/2 teaspoon caramel into indentation in each cookie. Cool 15 minutes. 5. In another small microwavable bowl, microwave chocolate chips and shortening uncovered on High 1 minute to 1 minute 30 seconds or until chips can be stirred smooth. Drizzle chocolate over cookies. Let stand about 30 minutes or until chocolate is set. Chill dough for about 20 minutes to make it easier to shape. To drizzle chocolate easily, spoon melted chocolate into small resealable food-storage plastic bag; cut small tip from 1 bottom corner. Squeeze bag gently to drizzle chocolate over cookies. Recipe by Edwina Gadsby @ Betty Crocker. Picture by Laura Flowers. I am sure I can enjoy them without any guilt,lol. Ciao Laura!! ci credo che sono meravigliosi!!! bravissima! This is really good. Seems like we all try to balance between the guilt of taking the easy way with a mix - and being so busy some days we're grateful there is a mix! I pushed the button too quick - I meant to also tell you I love your "other Laura" story. How fun was that! These look yummy and last time I checked guilt and yummy were not in the same part of the alphabet. What lovely cookies. I still think you can claim that you made these because there were more ingredients involved. Also, you put your beautiful decorations on top of them. I could never make cookies that beautiful. P.S. I agree with you about men cooking. Thank you for including them haha. Seriously, I hid a box of cake mix in my shopping cart once. The I made sure the coast was clear before I went to the check out. Never again! Laura, With this sufficient list of ingredients no need to feel guilty! These sound so decadent and look beautiful! YUM! That is so funny, I feel EXACTLY the same way when I use a mix! These cookies look lovely however! I feel like that too!!! I hate when people compliment something I 'half-made' and I never know what to say... "Uh thanks... but I can only accept half of that compliment?!" 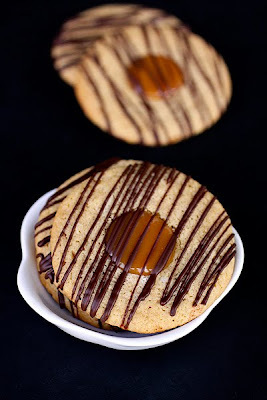 Laura - These cookies are so beautiful and they sound wonderful! Sometimes it's ok to use a mix, right?! I so enjoyed this post! I have to check the book out you mention and the cookies, well . . . they look wonderful. Excellent. I was talking with friend Amy (Gourmet Editor) just Sunday night. Same guilt. The only box thing we ever had growing up was Angel Food Cake. My mother claimed it was better than what you could make from scratch. I'll try to get over the guilt with these beauties. Thanks. I won't tell anyone. ;) They look gorgeous. I could eat these without any guilt!!! They look delicious and I love the drizzle! so so pretty! i've never been able to master the perfect drizzle like yours! As long as they taste good, then nothing else matters :D. I could go for some of those with a frappuchino right now. i have the same guilt! I'll be stressing out about what to cook for dinner and my husband will say, "Just open a can of soup." I just can't do it. There's nothing wrong with taking a short cut now and then. And these cookies looks soooo good. Love the caramel and chocolate. These are the most delicious looking cookies! I don't mind that you used a mix - there's a recipe in there too. But I often feel the same way. Cute story about Laura. I'm so happy that you all liked the pasta! I am shocked over the response I've gotten from it. I really didn't think anyone would be interested in it. It's turning out to be one of my most popular recipes. Thanks for trying it! I know how you feel. I've always felt the same way regarding the mixes. We should have a new take on it....as long as we're the only ones that know it was a mix, then its still homemade. After all, it was made in the home, and that's the real definition of homemade. LOL! Right? Mix or no mix, these cookies look divine and you should totally be proud of them! I never do mixes, but these really are great... a little of each is a very smart idea! Laura, I will have no trouble enjoying these cookies. They look delicious. I love coffee and anything with coffee. They look just perfect and iam sure delicious too!! Sometimes, it's a blessing to have a mix to help us out! These look fantastic--mix or no mix! They're beautiful! I will looking out for you on Tuesday, 2/9/10...How exciting! Those look great! And I especially loved your editorial about wanting to get back to the way things were made before the mixes. Although sometimes you just don't have time to do it from scratch, there's a pride and sense of accomplishment that comes from starting with flour and sugar. Please check me out sometime at www.bakingwithoutabox.com as that's exactly what I'm trying to do. I will definitely be back! These look fantastic and your photography is superb. These are beautiful - perfect chocolate drizzle on top! I to have such a hard time taking credit if I didn't make it all from scratch! Like...doctoring it up isn't enough to call it your own. But hey...if it's good, it's good. and thumbprints look great! Hi Laura, Those look fantastic. I often feel the same guilt (sometimes) I do feel better when i make from scratch it is just something about the recipe that makes you want to shine...Lol. I do use box sometimes mostly if i need something quick. Great blog! I love mixes and have no guilt using them and taking all the credit. I did bake it, even if I did skip a few measuring steps, so there. These look fabulous!! !